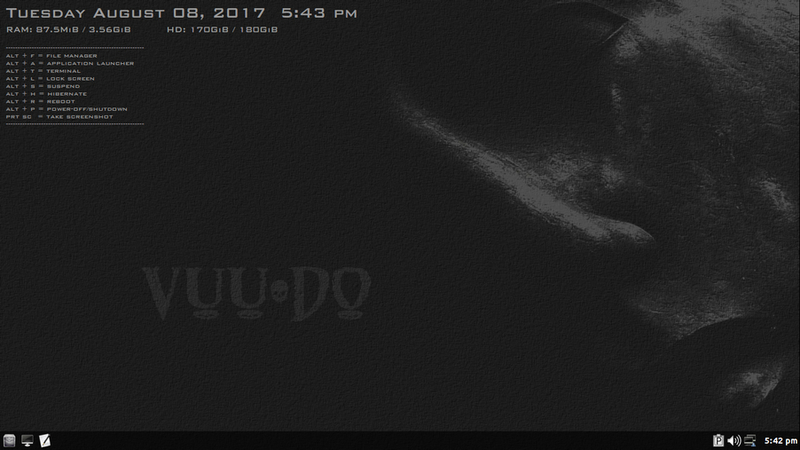 » Vuu-do Linux! *New Openbox-64 iso's (1.0.7) up 2-02-18*!! Re: Vuu-do Linux! *New Openbox-64 iso's (1.0.7) up 2-02-18*!! Ram used: 88meg with no applications open. Wow. Used forcepae option to get it to boot. Impressions: Oh my absolutely beautiful. Thank you for this spin to play with. :) Internet works booted to desktop no trouble. There is some hardware (odd enough) that were dropped from the support lisr from Jessie to Stretch and mine happens to have GFX from that list. I thought wrong not to check before I upgraded and BOOM. Black screen syndrome, no going back. On default as soon as it stabilized I right clicked, the menu came up and it froze. Only power supply interruption could get me out. On nomodeset?? it froze before I even clicked. I know loading to ram will not work with 256K and what is the other option? install everything missing. That pc had Jessie on for a while, and it run sluggish. Wheezy run at least twice faster!! I just thought of somthing. What if conky or some other gadget that initiates during openbox login, spikes up memory and causes the freeze, is it possible to have a script on the live part that would scan for a swap partition and use it? Having an fstab entry for say /dev/sdb /swap ..... would work for most people with 32bit single disk systems, but it will cause an error on anyone else. Then after putting the iso to a usb stick on the free part one can create one swap partition before use on a 32bit system. Otherwise the script may look for an existing swap partition in the hd, if it already exists. Just a thought. Nobody wants to waste bandwidth to download a swap partition or swapfile, but that would be the easiest way around it. Thank you, this helps with such bottle-neck systems. Nice, short & to the point article. If I am not mistaken their approach has been different than devuan's in that they have restricted systemd but have not completely gotten rid of it. Devuan & AntiX are about the same in that regard. Edit: I'm beginning to prefer Vuu-Do, (or MIYO), even over AntiX because they leave more choices to me. Hey sorry for delayed reply, haven't had time to get online the last few days, some out-of-town family emergency stuff has kept us busy. I don't think conky would cause that, but I guess it's possible. Conky always is a little iffy on a livecd as to whether it displays properly when you boot up, there's a delay on the startup command that works fine for an install, but isn't always enough for a livecd which takes longer to boot. You can click the conky on/off switch a couple of times and it will come back up and display normally. I think you're just running out of ram, either that or possibly one of the older non-pae kernels might work better on your particular machine? Interesting either way, if you like i'll load up the 32 bit on my build partition, and turn conky and some other stuff off and run you a custom iso to see what's what, i'd like to know the result as I may want to make a special run for old old low spec machines, I like the challenge and it's always so satisfying resurrecting older hardware. I guess I could offer an extra boot choice in the menu that does this? Seems like it would be a good thing to use anyway, as otherwise what can a livecd/usb use for swap if it needs it? Also see 'man live-boot' and 'man live-config' for many awesome things you can do at the boot command. I do, guess it would help if I read the help that's already on every iso I make, lol. Another cool thing to add to next Vuu-do update run. FYI to all: I think I forgot to mention it, but new Vuu-do ob-32 includes the latest obmenu-generator script, version .99, let me know if anyone has issues with it. Openbox-64-maximal is pretty much done, just need to test a couple things. Tons of small changes to configuration, getting everything standardized and dotting a whole lot of I's and crossing T's, more work done to Oxy2-ZEN icons, tint2, openbox etc. Doesn't sound like a lot, but it was hours of poring through the system and fixing stuff. FYI : I also do all this to the root account on my iso's, if you like to run as root you will be pleasantly surprised to find the session identical in every respect to the regular user experience with the exception of conky, which I leave off autostart in the root account so I remember i'm running as root, lol. Right-clicking on the clock in the panel will now change your timezone (by running gksu dpkg-reconfigure tzdata), left-clicking will still open calendar app. The clock tooltip has been changed to reflect the new options. Dropped a couple small packages that weren't needed, and did a better job rooting out unneeded cache files. All iso's updated to current, Devuan pushed another kernel update amongst many others, so that's what triggered these iso updates. Openbox iso's include the new 0.99 version of obmenu-generator, and my own newest re-do of os-probes. Replaced Gsimplecal with Osmo, it's a much more full-featured calendar app, also for notes, tasks, and contacts lists. It's not in the menu, to activate you just left-click the panel clock like you normally would to activate calendar. Plus some other stuff I likely forgot to mention. Nice! Will grab ASAP and try out. - will there be a way to eliminate the desktop "background" image, or make it one transparent pixel? - will wicd re-connect promptly (and will it shut off wifi)? - if I add vlc, will it be able to find the default audio device? - coming back from suspend, the display won't remain blank, will it? Just installed the previous one (ob 64b vuudo-ob-64+-20170727_1723.iso), it was upgraded to ascii, eudev'ed, and it is running great. The wird thing is that the issue I was having on the 2 previous installations with mouse and keyboard freezing on login screen is not appearing here. So now I have to study the differences and it is not related to this xorg bug. One thing I wanted to ask the creator was about the i386 arch being included. How do we turn it off and what was the logic of including it? I am wondering since the problem I had on login was on a miyo install, if by any chance something relating to X came from 32b and is causing the problem. The other is lxpolkit, why shouldn't be there and autostart? Even though you install a default sudo for the user pretty much nothing on the menu that would require sudo will not start. You install and run lxtask and everything works (mounting volumes from pcmanfm, synaptic, etc). There may be a reason that escapes me, that is why I am asking. Anyway, overall I like it much more than standard devuan as it already has the majority of what I am used to already done. 1. Make sure automount is NOT enabled for usb. 2. Plug in your thumb drive. 3. Run 'refracta2usb' from a root terminal (or sudo). 4. Click on the Help option. Read the first few paragraphs. Keep in mind that it's like a Swiss army knife - it has a bunch of utensils in case you ever need them, but you'll probably never use all of them. Just pick the one(s) you need at any given time. Hint: create a vfat that's big enough to fit a few isos and an ext partition for other uses, but don't use it yet. Get one iso running then talk to me about persistence (or read the rest of the Help). One thing I wanted to ask the creator was about the i386 arch being included. How do we turn it off and what was the logic of including it? As you found, it can easily be removed if it's not wanted or needed. Congratulations greenjeans! Looks great my friend!